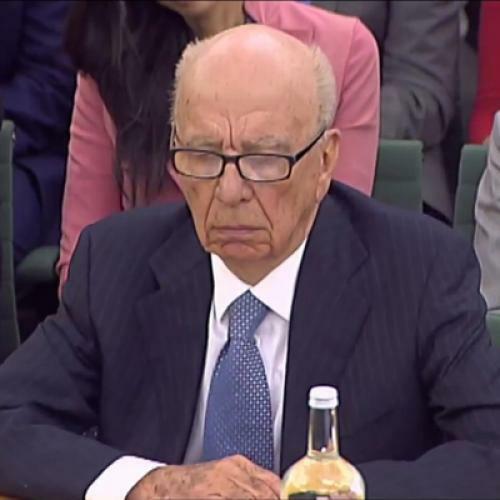 A camera-mobbed Rupert Murdoch walked into yesterday morning’s hearing a Bond villain, an evil overlord, an all-seeing eye. He walked out of it a pied, deflated, piteous figurehead, with the committee apologizing to him, comforting him, and praising his “guts and leadership.” The Murdochs’ theme wasn’t denial, nor was it really apology. It was innocence through ignorance, victory through stupidity. While Rupert languished, his son James dodged. With a battery of corporate jargon and “not to my knowledge” shrugs, James claimed his rightful place as the slippery, scheming heir to an out-of-control empire—one his father clearly does not know well enough to rule. News Corp shares have gone up 5.25 percent since the start of the hearing. In short, the Murdochs won. But James turned ignorance into art. He ducked and weaved in front of his father to counter questions, flinging back meaningless details and incomprehensible buzzwords: “Outside legal advice had been given with respect to the quantum of damages respected.” “There are thresholds of materiality whereby things have to move upstream.” The word “hacking” became “illegal voicemail interceptions.” Hush money became “settlements for illegal activity.” Pressed for yes-or-no answers, James gave neither. Labour MP Tom Watson, the dogged man of the hour, stormed on. Was Rupert aware of the emails reviewed by Lord McDonald, showing evidence of felonies and breaches of national security? “Let me address these,” pleaded James. “No,” Watson said. Rupert’s brow remained furrowed, his eyes on the table. A solicitous James tried again: “Perhaps it would be helpful if I could answer these questions.” Watson would have none of it. “Your father is responsible for corporate governance at your company,” he snapped back, before stating what most in the room were already thinking: “It is revealing what your father does not know.” The air of invincibility had long since fallen. The Murdoch bravado and swagger was a distant memory: It was all grimaces and awkward pauses. James had to tell Rupert to stop gesticulating in his confusion. Wendi Murdoch pouted and fidgeted in the background. And then Murdoch got his wish. There are few, if any, public figures who have been so utterly rescued by a pie to the face. Suddenly, the demagogue had become the victim. As the news cameras panned away from the carnage, a blazing “right hook” from the 6-foot Wendi Murdoch turned into a slap heard round the world. Ironically enough, the protestor walked away with more foam on his face than Murdoch himself. Every network showed the slow motion replay: an old man, reminiscing about his father, interrupted by a yelling assailant. If anything, it wos the pie wot wun it. As MP Mensch later tweeted, “Mr. Murdoch (and Mrs. Murdoch) came out of that w/ great credit.” One could now almost feel sorry for the enfeebled, know-nothing chairman. The world had the perfect visual metaphor for Rupert’s presumed lack of leadership, his failure of command. The pie-faced mogul didn’t know anything. He gesticulated hollowly atop a besieged empire, a too-old figurehead with too much money, too much power, and too little grasp. The myth of Rupert the omniscient tyrant, the bogeyman, the man behind the curtain, has disappeared in a haze of foam, “whos,” and “whats.” Has he considering resigning? “No …. People I trusted let me down. It’s for them to pay,” he said. (Rebekah Brooks was soon to enter, bewildered and ashen from days in prison. It is clear who is soon to take the fall.) Then Murdoch added an incredible afterthought: “I’m the best person to clean this up.” For once, the assembled MPs let the comment slide. Yesterday, with their “out-of-touch” defense, the Murdochs were either honestly stupid or stupidly dishonest. But from James’ performance and Rupert’s pieing, it seems clear that only the son has the skill and knowhow to do dumb well. James was the terrifying one—smart, nimble, rapacious, and potentially dangerous—while Murdoch gets to play the fool, far removed from a vast criminal conspiracy. Rupert ended the day looking weak and irrelevant. The evil legend has exited, leaving nothing more than a foamy, forgetful man.